Singapore’s National Day Rally was temporarily suspended Sunday night after the city-state’s premier Lee Hsien Loong suddenly took ill during his speech and was briefly escorted off stage before returning after around an hour. About an hour into the English portion of his two-hour annual speech that began at 8pm Singapore time, Lee, 64, was seen shaking and clutching the podium for the support. He was then ushered off stage with the help of several cabinet ministers. The rally was suspended and the broadcast of the program was temporarily interrupted. Lee later returned to the stage and resumed his speech at 10:40pm to loud applause from the audience. “Thank you for waiting for me. I gave everybody a scare,” he said. Lee’s official Twitter account said that a medical team had attended to him and assessed that his condition was “not serious.” It said Lee “was feeling unsteady because of prolonged standing, heat and dehydration,” adding that his heart was fine and he did not have a stroke. Lee has twice been diagnosed with cancer but recovered following treatment. Resuming his remarks, Lee left out the portion of speech about an elected president, but continued on addressing parts of the speech regarding leadership succession and the broader picture of where Singapore is and where it will be in the next few decades. 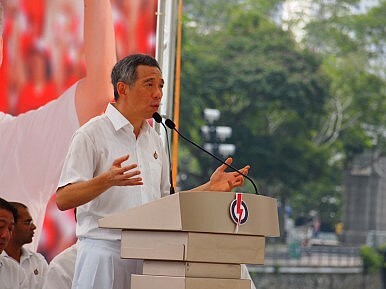 On leadership succession, though Singapore has put together a core team in its cabinet for the next generation, Lee said that it was important to address this subject because, as his scare as well as the stroke suffered by Finance Minister Heng Swee Keat had proved, all ministers are mortal. Lee said Heng would soon resume his duties and that Lawrence Wong would be appointed second minister to help Heng. Squabbling Lees Highlight Singapore’s Dynastic DilemmaSingapore Reviews Elected PresidencyFormer Singapore President Dies at 92Singapore’s New Political Reforms: What You Need to KnowWhat Did the 9th Malaysia-Singapore Leaders Retreat Achieve?